While hunting, we extend an exorbitant amount of energy. That energy expenditure starts when we step foot out of the truck and doesn’t end until the last gamebag full of meat is in the cooler and through all of that hiking, we are sweating. Sweating results in the loss of electrolytes (sodium, potassium, calcium, and magnesium). That loss of electrolytes can lead to muscle fatigue and cramping over the duration of a long hunt. Over the years I have tried several methods for replenishing lost electrolytes (mainly different powder drink mixes). And this year I started using salt pills made by SaltStick on all my scouting and hunting trips with great results. 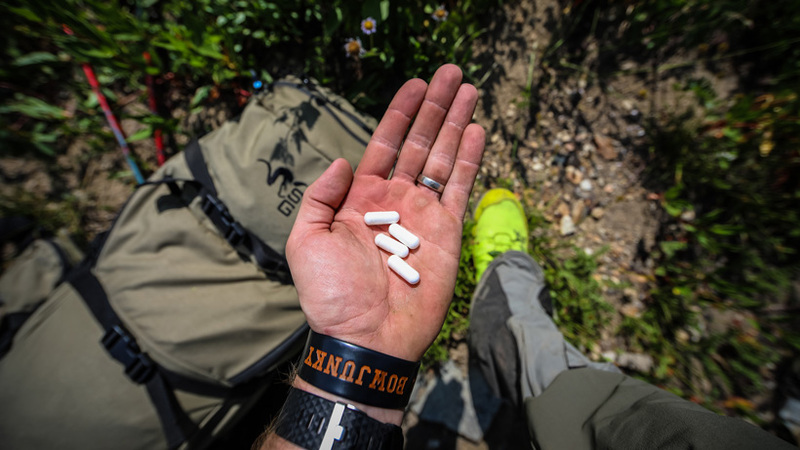 Salt pills are used by many endurance athletes, and if they are good enough for high-intensity mountain races, I feel they are perfect for hunting. 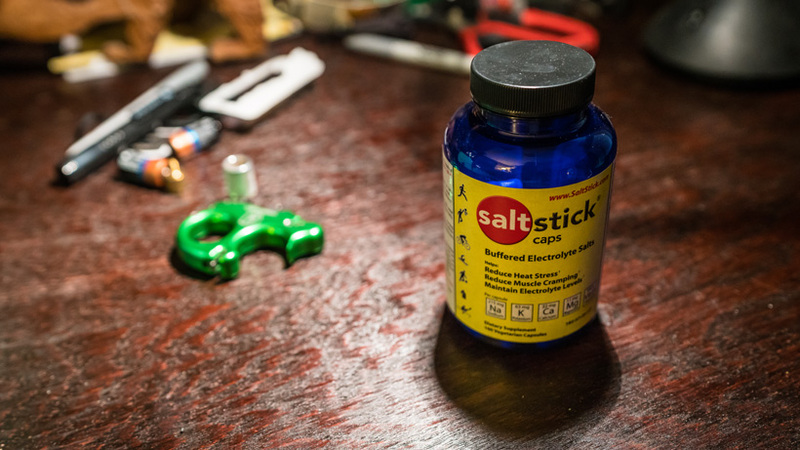 SaltStick caps for replenishing electrolytes. For my style of hunting, popping a few salt capsules is way more efficient than trying to mix electrolyte powders. Don't get me wrong, a lot of the powders can help, but for me, I don't like to pack around a bunch of powder in a Ziploc bag. That bag could tear in my backpack, and involves dirtying up a collapsible water bottle, bladder or Nalgene bottle. Some people might like the added taste boost to water with powders, but remember that I do go by the "food is fuel, not fun" mentality on most hunts, so I don't really feel the need to flavor up my water while hunting. 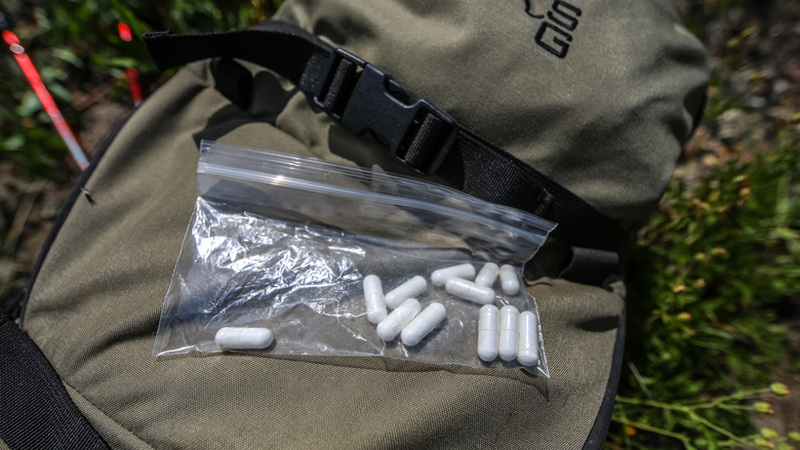 During days when I am expecting a big hike, I'll pop two capsules with water roughly every 60 minutes of strenuous activity and then a capsule after I stop a big hike. This method greatly helps replenish essential nutrients lost to sweat and works very well for me. Keep in mind that according to SaltStick's website, they don't recommend taking more than 10 capsules a day. I've been using their regular SaltStick Caps, but you can also get the SaltStick Caps PLUS that have an added caffeine boost. I haven't tried the PLUS caps yet, but for me, the higher amounts of electrolyte in the regular caps were my deciding factor in which one to purchase. SaltStick Caps have the following ingredients: 215 mg sodium, 63 mg potassium, 22 mg calcium, 11 mg magnesium, and 100 IU Vitamin D.
A little side story in my search for something to use while hunting, in 2014 I was routinely putting on 25-30 miles of hiking in a 1.5 day period scouting for a mule deer hunt. The trips were very physically demanding. I’d drive all night after work on a Friday, then go right into hiking in the dark to avoid the blistering hot sun at high elevations. Well… one of those trips finally caught up to me. I was hiking down after scouting and my legs completely cramped up. This was the type of cramping that lasted a long time and made it very difficult to keep hiking. The cause of the muscle cramps I feel was due to exerting so much energy and sweating a bunch, but I wasn’t replenishing what I was losing due to all the sweat with just water. In some sense, I was getting very dehydrated due to the limited water that was available at higher elevations. I was eating well, but that wasn’t doing everything for me. The problem with my cramping was most likely due to me only consuming straight water. I needed something more from my water with the amount of energy I was burning. But isn’t sodium a bad thing? 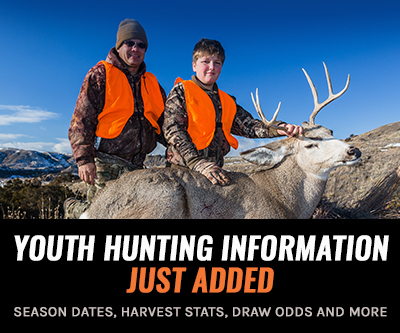 I often hear people talking about the high level of sodium in certain freeze dried foods, but what they might not realize is that sodium can be a huge asset on a grueling hunt. The day-to-day foods I eat when I am not hunting are already low on salt, so this added salt pill boost seems to reduce the impact of cramping. It is fairly obvious that when carrying a heavy backpack and hiking up and down mountains all day that anyone will start to sweat. According to SaltStick (and research papers I’ve checked out), sweating causes the average athlete to lose roughly 11 oz of sweat during 30-60 minutes of activity. Plus you are losing 220 mg of sodium, 63 mg of potassium, 8 mg of magnesium and 16 mg of calcium. This means that you want to find something that can closely resemble the electrolytes lost through sweat. When I was younger, my dad had me drink pickle juice throughout the week to help replace lost sodium due to sports practice. It must have worked because I rarely had cramps. Some of the options like pickle juice would be a little difficult to consume on hunts, which is why salt pills have always intrigued me. There are definitely other options you can use for alleviating muscle fatigue and replacing electrolytes, but for the price per capsule of salt pills and their ease of use, so far this is my favorite system for electrolyte replacement. My system is fairly simple when I’m in the mountains. I really don’t enjoy mixing hydration type powders into my Platypus water bladder as it leaves a bunch of residual taste. If you like using powders, I would highly suggest a collapsible water bladder or a Nalgene if you’re not concerned about the added weight. As always, definitely test out how your body responds to any supplements before you go head first on your next hunt. I'd love to hear your thoughts on other methods you've tried. Update, the SaltStick pills freaking saved my father and I on our AZ Coues hunt we just completed. Friday 11-9, I had taken a couple in the morning before heading out. After shooting a buck at a somewhat long distance I had to climb this steep hell hole to recover the buck. We left all out heavy stuff at the base. Once I returned to the base I laid down to rest, then the cramps started to hit, starting in a foot and running up my leg. I popped a couple more pills and downed a liter of water, 15 min later the cramps were gone. It made the mile plus hike to the truck with 1/2 the deer and my heavy stuff (optics water food stove) possible. I upped by dosage for the remainder of the trip and suffered no further cramping. A few days later while hiking out after an evening of glassing my 75 year old father was struck with nausea and weakness after a climb to a saddle we had to cross. A liter of water 3 Salt-Stick pills and 20 minutes later he was pepped and able to complete the hike out. Very timely. Last weekend I went on a +5000 foot training hike to 11k ft. I hydrated like crazy but did not add salt. I hauled 60+lbs (the first time for me. 54 btw) up and back. Towards the bottom, I cramped up a calf and tripped crashing to the ground. Thankfully it was in a wide open flat section and not the side of a slope! I actually thought I'd torn a tendon, but luckily it was just a cramp. For 3 days after I suffered from dizzy spells and looking back on it, I now feel this is all due to an electrolyte imbalance. One added note. I have been on a ketogenic (modified) diet since April, and it is known that if on that diet one should always be adding MINERAL(pink) salt to your diet. I do, but apparently not enough for a very strenuous hike. I'll be adding more from now on out. Thanks for the reminder! Great stuff Brady. I've been trying to pay close attention to my sodium levels recently, not only on hunts but in day to day life as well. Having a way to replenish all those electrolytes lost is essential. I do not feel normal unless I'm drinking plenty of sports drinks. Now I'm going to give salt pills a try. Something to keep in mind - coffee for me is a big time diuretic; specifically expending my body of even more electrolytes and nutrients. We all love our coffee on those cold, fall mornings. But coffee + heavy hiking = lots of lost goods. At least for me. I always hear concerns about high sodium levels but it seems like the other way around is more prevalent during hunting. Low sodium levels cause all kinds of issues from dizziness to "brain fog" to low energy to cramps and more. Of course, every person is different. It's an interesting topic and something to pay attention to. Appreciate the work. This article hits home I returned a couple weeks back from a backpack elk hunt in CO where I shot an Elk 7 miles in. I tried to arrange for a packer unsuccessfully the evening I shot my elk. Monday morning I started hauling meat and camp and did 21+ miles that day and got 3 quarters of my elk out and almost all my camp. Tuesday was only a 15 mile day but my pack weighed a lot with a hind quarter, trim bag, my tent and my small trash bag strapped to it. It took me 5 1/2 hours to get out and by 3 am the next morning I was in something my nurse wife called RABDO and spent 2 miserable days sick. These pills and powders will definitely be on my gear list for next time. 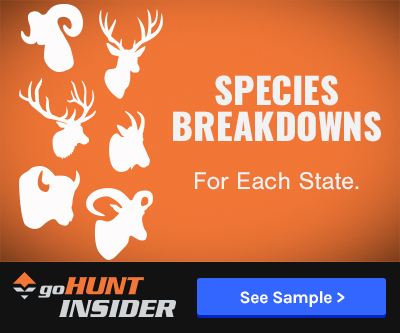 I see products like this an other aspects being promoted to pick up hunter dollars all the time. My thoughts always go back to the same question. What would the Native people of the earth used during their lives to combat these issues? Did they need a salt pill at all? I had a similar cramping issue while on strenuous Coues deer hunts in 50-75 deg weather. I would hyper-hydrate and consume bananas and straight salt to stop them. My Doctor said the cramps were directly due to a loss of salt in my sweat. Due to this issue I found that a certain percentage of people loose a lot more salt than others so they can quickly get into trouble when performing long periods of strenuous physical hiking and not replenishing directly with salt. Those cramps can be murderously painful and they keep coming once they get started. I seemed to suffer them the most once I relaxed in camp. I'll be getting some of those pills to use instead of using salt directly. BTW - things like Gatoraid didn't seem to provide any relief at all for me, I guess maybe its too diluted. Straight salt and lots of water was the only thing that worked. This article really hits home for me. I sweat very heavily when climbing on early season hunts. Last month, in the Yolla Bolly Wilderness, I experienced the cramps you describe when packing in for a 8 day adventure with my son. I have always hydrated well because I know that I need more fluids than the average person. I had even purposely trained in high heat all summer in order to prepare for what I knew was going to be a tough hunt with a 20 year old partner. I learned a couple of things on this trip. One is I will be dumping my filter. Filtered water removes the minerals and that doesn't work for me. Every electrolyte powder either has sugar or some sort of artificial sweetener, both of which are better avoided in my opinion. I have seen these pills on the shelf before and will have to try them out. They might be just what I need. 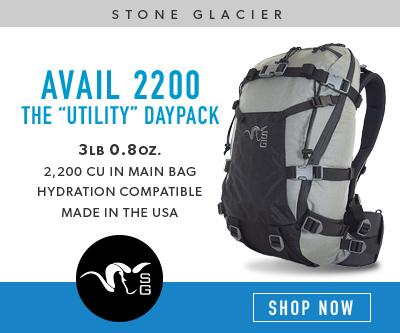 I have never experienced cramps like this, especially deep in the back-country with 60lbs on my back and no idea where the next water was towards our intended base camp. We turned back to the last water we crossed and made a wise decision to day hunt from from there rather than deeper. Great article, two things come to mind. I am a Safety and Occupational Health Specialist, and work with professional military folks everyday. Department of Defense has been a strong proponent of salt pills since the beginning of time. First, make sure that no matter what you do you are not exceeding the minimum daily allowance as recommended for your body weight. This data can come from your family Doctor, the FDA or someone who is well known like the Mayo Clinic medical website. Using your family doctor, is a good source as they will know your medical history. Second! Not all cramps are created equal, and strenuous exercise (hunting) can play hell with cramps. If you are already having issues with night cramps and taking medicine for it, make sure that the salt pills and the cramp medicine jive by asking your MD. Great article, I am going to order some to try on my winter exercise routine. I agree with the idea of soiling a water container just to get your salt on. I appreciate the the article.